The Collection Development Section is seeking nominations for the Daniel T. Richards Prize for writing related to collecting in the health sciences. The Richards Prize will be presented to an individual who created a work in any format related to collecting in the health sciences. This work must be widely accessible to the library community and written or produced within the last two years. For further details about the prize, see MLA collection development. The deadline for nominations is Wednesday, January 23rd, 2013, 5:00 P.M.
CT. Self-nominations are acceptable. Nominations need to include complete names of authors, addresses, institutional affiliations, and the complete citation along with a final version of the work. E-mail nominations to Rebecca Raszewski, Awards Committee Chair. Notification to the winner and the winner’s institution, and announcements in Developments and MLA News will be made prior to the annual MLA meeting in Boston. Application deadline is September 14, 2012; if not filled, applications will be reviewed weekly thereafter until the search is closed. Hiring is contingent upon eligibility to work in the United States. A background check is required for employment. ASU is an EO/AA employer and actively seeks diversity among applicants and promotes a diverse workforce. Say hi to Ginny Pannabecker ! Virginia (Ginny) Pannabecker is the new Health Sciences Librarian for Arizona State University (ASU) at the Downtown Phoenix Campus. Ginny is a fairly new member of CABL, having joined in early 2012. Previously, Ginny was an Operations Supervisor at the ASU Noble Science & Engineering Library on the Tempe campus. She earned her MA in Information Resources and Library Science in May 2009 from the University of Arizona —Tucson. Ginny enjoys films (in any language! ), cooking, hiking, camping, and spending time with her husband and two daughters.Welcome Ginny ! Jessica Cole is the Academic Programs Librarian for Northern Arizona University located at the downtown Phoenix Biomedical Campus. Jessica is the newest member of CABL. Previously, Jessica was a hospital librarian at Mayo Clinic Health System in Minnesota. She earned her MLIS degree in August 2010 from the University of Wisconsin—Milwaukee. Jessica enjoys music, hiking, and spending time with her dog, Gigi. Please welcome Jessica to Arizona ! Congratulations to Sue Shelly ! John C. Lincoln Health Network welcomes Sue Shelly as the new health sciences librarian. Sue earned her diploma in nursing from the Grace Hospital School of Nursing in Detroit, Michigan, and later her BSN from Indiana University. After more than 20 years in Med-Surg nursing and Occupational Health nursing, she found herself drawn to the intellectual challenges of information organization, teaching, and library work. Since earning her MLS from Indiana University she has worked in public, academic, and more recently as the consumer health librarian at Banner Thunderbird Medical Center in Glendale, AZ. Congratulations Sue ! Do you know someone that is a dynamic and exceptional hospital librarian–a visionary who deserves to be recognized for his or her outstanding service in hospital librarianship? Now is the time to nominate them. Self-nominations are welcome! For details and a nomination form, see http://www.mlanet.org/awards/honors/. The deadline for nominations is November 1st. Please direct any questions to Elizabeth Kiscaden, Jury Chair, at kiscadee@mercyhealth.com. 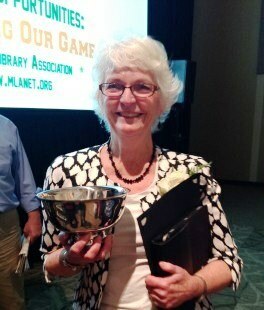 Jacque Doyle receiving Marcia C. Noyes award at 2012 MLA Awards Ceremony and Luncheon. She was so happy and excited but speechless. Thanks to Gary Freiburger for photograph.